Judy Woodruff interviews the Aga Khan | Ismaili.NET - Heritage F.I.E.L.D. Woodruff: Let me begin by asking you to go back to September the 11. Where were you and what was your reaction when you heard what had happened? Aga Khan: I recollect being in France and I recollect these horrible images. I think the impact of those images was something that no person who saw them in real life will ever forget. Woodruff: Did you know so many people, after two towers were hit, assumed it was terrorists? How quickly did you come to believe that it was the work of Osama bin Laden and his network? Aga Khan: Very quickly. Very quickly, because, having followed events -- particularly in Afghanistan and the things that had happened in Kenya, Tanzania, where they have a lot of activities going on, the attack on the Cole - - it all seemed to fit a pattern. So there was a logic to it. Woodruff: And yet, did you believe they were capable of something like this? Aga Khan: No, I think the dimension of it was something completely distant in my terms, completely unexpected. I have to say, however, that what happened in East Africa was itself pretty awful. In Nairobi and Dar es Salaam, and if I'm not wrong Kampala was on the list. Woodruff: With the embassy bombings and so forth. Woodruff: Is there any doubt in your mind now that Osama Bin Laden is behind what happened? Aga Khan: I don't have direct evidence of that, but everything I've read would certainly confirm that, and certainly my knowledge of what was going on in Afghanistan would confirm that in the sense that Afghanistan had become a territory which a large number of organizations of that type were operating -- not just Osama bin Laden. Woodruff: Since then, as we know, the United States has led a coalition of countries in the war to go after the Taliban and al Qaeda inside Afghanistan. Have you agreed with the conduct of that war for the most part? Aga Khan: You know, I think what happened in Afghanistan was a continuing degradation -- into an unacceptable state in the civilized world. And the question was, how was that going to unravel? Clearly it had to unravel at some stage, and the fact that it had to unravel this way is a result of the 11th of September. Whether it might have unraveled differently if it had been analyzed differently and earlier is a good question in my mind. Woodruff: How could that have happened? Aga Khan: I think by an earlier understanding of the failure of engagement as a policy issue with the Taliban. As a better understanding that this wasn't just bin Laden, that there were many other organizations operating out of Afghanistan. Therefore, maybe a more thorough comprehension of the buildup of risk that was taking place in Afghanistan. Woodruff: Are you suggesting that the action against these groups should have come sooner? Aga Khan: I am suggesting that that might have been the conclusion if there had been more focus, more total focus on (Afghanistan), yes. Woodruff: And having said that, do you believe for the most part the conduct of the war has been a correct one? everyone has to be very unhappy about. But what worried me at the beginning was my concern about the postwar situation, and in that sense I have been very, very relieved by the result of the Tokyo Conference -- in the sense that this is a process through which we're living, but hopefully it will result in a significant new destiny, not only for Afghanistan but for that whole area of the world. Woodruff: And I do want to ask you about that, but I first want to ask you about the civilian casualties. Are you satisfied that the United States has done, and others in the coalition have done, all they could to keep those to a minimum? Aga Khan: Within the Afghan context, yes. But, the Afghan context is so complex, that it would have been nearly impossible frankly to have 100 percent result. I think one has to understand the complexities of getting correct information out of Afghanistan. One has to be aware of the difficulties of understanding the relationships between the peoples, the ethnic groups, the various militias. Those who have long-term objectives in the country which go far past the peace process and in that sense I think there may have been situations where frankly the US and others have been misled. Woodruff: What do you mean by that? Aga Khan: Well, I think that there are internal situations where information has been passed to the U.S., which probably has not been possible to verify. And there have been situations, which unfortunately occurred. But that's what occurs in a country as complex as Afghanistan. It's part of the process of war, isn't it? Woodruff: Is there anything that could have been done do you think, to mitigate that? Aga Khan: In the time frame, probably very difficult to do. Because I think there was a lot of pressure to complete the exercise in the shortest possible time that was wise and sound. But there's a balance between speed and knowledge or speed and information. Woodruff: Is the war over, as far as you're concerned, if they haven't found Osama bin Laden and Mullah Omar? Aga Khan: No, no. I think that returning Afghanistan to a situation of law and order is going to take more time than we are today. So it's not over in Afghanistan. Woodruff: How important do you believe it is that bin Laden is found? Aga Khan: Probably significantly less important now than when we went into Afghanistan, because I think that there is now a significant focus on the terrorist networks operating around the world. I think there is a much better understanding of the sensitivity of these conflicts and how they become internationalized, how they go far beyond the frontiers of the area. I'm thinking of places like Sri Lanka, and I'm thinking even Northern Ireland. It's not just the Islamic world. It's these conflict situations which pollute and the disease just grows and grows and grows. And I think the lesson is that the civilized world today has to be a lot quicker to go into those areas and try to find workable solutions. Woodruff: Are you talking about use of force or something else? Aga Khan: No, no I am talking about diplomatic and economic solutions. Many, many of this issues or these areas are caused by communities who feel victimized who feel they are unable to achieve justice and so they turn to rebellion. Armed rebellion. And many of them really have historical roots. If you look at the Philippines, that situation's been there since the mid-60s. You look at Kashmir, you look at the Middle East, you look at Northern Ireland -- these are all situations which have been there for much too long, in my view. Woodruff: So is there something the United States, for example, should have done differently to prevent some of these situations from getting out of hand as in the Philippines? Aga Khan: I would not want to pass judgment retroactively. I think what is important is to draw the lessons of where we are today. I think where we are today is essentially a statement that these situations -- which appear to be low- key local situations -- if they are left to pollute, they grow into international issues. The global community is a real global community in that sense; it's not only on economic or political terms. Woodruff: And in these different situations you're describing, you mentioned not only the Philippines, you mentioned Kashmir and other places. Money is part of the answer, but it's not the only answer. Aga Khan: No. I think it's economic development; it's a sharing of hope instead of a perception of despair; it's communities who for one reason or another have suffered for many, many years or perhaps just suffered in their own perceptions. But in many of these situations, I think it's more the lack of confidence in the future quality of life. That's the real issue. Woodruff: And yet if you're sitting in the United States or in London or Paris, or any one of the other major capitals of the world, and looking at these places, you think, "We can't solve it all, we don't have the resources to go in, or the time, the attention." How do you know what is the right thing to do? What the right first place is to go? How do you decide what you're priorities are? Aga Khan: Well I think first of all its clear that the U.S. alone can't remain responsible to unravel these situations. I think it's a much more global issue. The second one is to determine whether one can predict where these situations will arise, or particularly when they are going from a local situation to an international situation. Probably better understanding of these situations earlier on would have helped. Woodruff: And whose fault is that, that that wasn't done? Aga Khan: I don't think one can blame people or governments. I think it's a lesson of Afghanistan. Woodruff: If you had to check off the places around the world that are the main places that we should be watching now, what would you say? You've already mentioned the Philippines. Where else would you say? Aga Khan: Well I would think obviously the Kashmir situation needs to be resolved, the Middle East situation needs to be resolved. There are certain situations in Africa which need to be resolved, and I am not in any way suggesting that they are easy. I am simply saying that I think that it is important that they be addressed vigorously and not be allowed to develop in time into more and more dramatic situations. Woodruff: And do I hear you saying that it's not all that important that Osama bin Laden himself be found? That the focus has moved on now. Am I hearing you correctly? Aga Khan: Yes, yes. I believe that, I believe that now what's important is to address the issues and the places and not worry too much about individuals anymore. The job's got to be done. Woodruff: You talked about Afghan development. Is Afghanistan going to get the aid, the assistance that it needs? Aga Khan: I hope so, and I think so. The Tokyo Conference was a good conference. I think many pledges have been made, and one of the conditionalities I see is the analysis of what can actually be achieved quickly in Afghanistan. I think there's more or less agreement today amongst most development agencies that there's a short term and a medium term. Whether there is a clear divide between the two is another issue. I don't think there is, personally, but clearly one needs to respond quickly, and responding quickly is conditioned by many things, including internal security. Woodruff: Your own development network is contributing $75 million, the largest single private contribution. Are governments being as generous as they should be, do you believe? Aga Khan: I think so. I think some of them will continue their aid. I think a number of them have limited their promises to a number of years. Quite clearly, the Afghan situation cannot be resolved in the short term. It's going to take many, many years to achieve definitive and permanent results. One has to, I think, keep in mind the issue of the poverty of the rural environment of Afghanistan. Woodruff: You've met this morning with the interim leader, Hamid Karzai. How confident is he at this point that his country is going to be stable soon enough to get this aid in place? Aga Khan: ItÕs not good for me to talk on behalf of Chairman Karzai, but I think he has a sense that the road map ahead is reasonably clear now, and that obviously if one can manage the risks in the Afghan situation, there will be a process of reconstruction where at least in the relatively short term there will be perceptible changes. Woodruff: What are some of the things that you think should be done right away to spend this money on, to get Afghanistan to begin to be back on its feet? Aga Khan: I think the first thing has got to be food security. A country that cannot feed itself is a country that is a permanent risk. And a significant part of the Afghan population lives from the land. So, rehabilitating Afghan agriculture would be, I think, essential. I think the second thing that will be essential is rehabilitating but also upgrading institutional capacity in the country: education, health care, financial resources -- the pillars of civil society. And I think that needs to be done very quickly and the difficulty there is, of course, that there's practically nothing left. Woodruff: The role of countries in the region contributing to that stability. Is Pakistan, for example, doing everything it can possibly do to crack down on terrorism? Aga Khan: I believe President Musharraf is taking a number of very clear commitments to reorient Pakistan, and from what I know his intention is genuine. I think he's taking a number of steps to get things done. But I think it's difficult in that sort of environment -- whether Pakistan or Afghanistan -- to set definitive time frames. You know these are complex environments, and in Pakistan, it ... has been difficult. Let's be frank about it. So, President Musharraf has a significant challenge ahead of him. I personally believe that his decisions are largely welcome throughout the country. That's going to be the criteria for judging. Woodruff: What about another country, Saudi Arabia. Do you believe, from your perspective, the Saudi government is doing everything it can to crack down on terrorists? Aga Khan: I would find it difficult to understand, because I know less about what's happening in Saudi Arabia in relation to what's happening in Pakistan. But clearly one of the issues that needs to be addressed in Afghanistan is the acceptance of pluralistic, theological interpretation. And that is a very central issue. It is to me essential that countries that have mixed populations or mixed schools of Islam should live in peace and harmony, and it is unacceptable to me that certain communities should be declared non-Muslim or heretic or whatever you may wish. But Afghanistan by its nature is a pluralistic society, so one of the critical issues is going to be to establish not only the legitimacy of their pluralism but its desirability. Woodruff: How do you do that though in the current situation, climate? 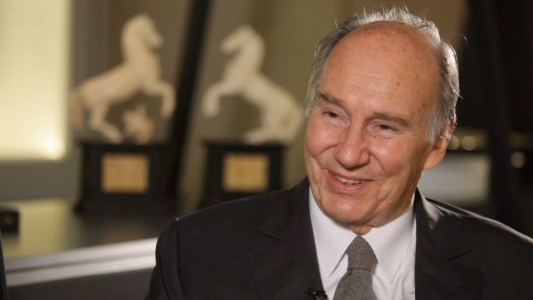 Aga Khan: It will take a lot of time. It will need to be done, I think, with claims to impose. You know, these situations today, to me, are impossible to live with, and they end up as you can see creating tensions and conflict. Woodruff: What would you want Westerners -- Americans, others -- to know about Islam? Because I think there is a feeling on the part of many that we haven't done enough to understand what's going on. Aga Khan: I have to say, Judy, that this is something which I believe in very, very strongly, and I believed in it for many, many years. I think Western society has an enormous need in its general education about this complex of 1 billion people, and that complex of 1 billion people is as pluralistic as Western society. And I'm not talking about the faith in Islam, I'm talking about peoples, the cultures, the geographies, the languages, the economies, the histories of an enormous part of human population, which is not part of general knowledge in Western culture. I can remember when I was a student here, in the general education courses at the college I attended -- those were general education courses which were aimed at teaching all the students that went to that particular university enough general education so that they could live through life understanding the general context, the evolution of human society -- not a word about the Islamic world: totally absent. Woodruff: But has that changed? Aga Khan: That was a long time ago, you're right. Woodruff: It's 2002, do you think the U.S. is doing enough? Aga Khan: Not enough. Certainly not enough. And I think part of the problem stems from the fact that there's this question: Are we talking about the faith of Islam or are we talking about the peoples? And my sense is, general knowledge is, that it's the peoples -- also the faith, but the peoples. Woodruff: I hear you saying the West needs to do a better job of understanding Islam, both its people and the faith. And within Islam, you're saying there is also a need to be more pluralistic. Aga Khan: Yes, absolutely. I agree. Woodruff: Who has to make that happen? Aga Khan: I would hope that the intelligence here, future generations of the Islamic world will look at these issues with knowledge, and wisdom, and a sense of how important they are for their own lives, their future generations. It's building a concept of the future. Woodruff: And is enough of that going on right now? Aga Khan: No. No, because I think much of the centers of the intelligence in the developing world generally have been left aside. In particular, universities, research activities, it paid the price, frankly, of development dogmatism of the '60s. What that meant was that primary education became the absolute goal. Higher education was starved. Yet higher education is where the best brains are concentrated for the best education. If you look at higher education in the part of the world I know -- which is essentially Asia and Africa -- there has been starvation. So these institutions, which should invest in the most sophisticated minds available, simply do not have the opportunity to do that. Now that's changing, but itÕs changing forty years too late, if I can say that. Woodruff: And one of the results of that is Osama bin Laden? Woodruff: And as someone who is devoted to your own faith how does that make you feel? Aga Khan: Well, I have done everything I could to try and contribute to a process of change. I founded the first private university in the history of Pakistan. I am now creating a new university in Central Asia. I am sustaining a number of university programs around the world. I will do so in Afghanistan also. So I think that this notion of investing in intelligence in order that they lead thinking is something which is central to the development process at hand. Woodruff: Your highness, we thank you very much for joining us. Thank you.